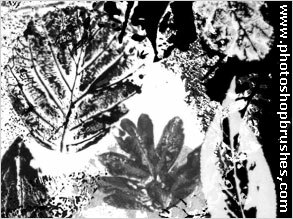 This is the latest Photoshop Brushes set featuring eighteen grunge style leaf prints, which my daughter and I painted and printed out. These new addition to the site have a selection of leaves some rounded, some long a good selection with some cool vein textures and shapes. Going to be digging out all the original files to the older photoshop brushes and re working larger versions of many of the existing photoshop brush sets now I have the server bandwidth sorted out, along with adding all the new stuff I have been collecting the past year.